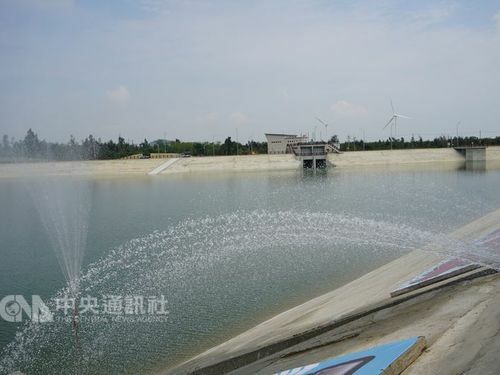 The photo shows the water link initiation ceremony held on Sunday in Kinmen County. Taipei, Aug. 5 (CNA) Kinmen County's plans to deepen links with China are not issues that can be acted upon by the local government alone but instead must be carefully measured and assessed, Taiwan's Mainland Affairs Council (MAC) said Sunday. The remark came in the wake of Kinmen Magistrate Chen Fu-hai (陳福海) having expressed the possibility of an electricity link and bridge link between the county and China's Fujian Province to follow after a water link that was established that day. Chen dubbed them the "three new links" -- a reference to the "three mini links" that opened postal, transportation and trade connections between Taiwan and China from 1991. During an initiation ceremony that was conducted in the offshore county, Chen pressed a button that symbolized the start of the channeling of water from Fujian to Kinmen. Chen said that after the water has reached Kinmen from Fujian, it will undergo treatment and could reach people's homes in as little as three hours, Chen said. The water link was a deal Kinmen signed with Fujian on July 20, 2015 to end longtime worries over water shortages in the county. In response, the MAC said that in order to take care of the infrastructure and development of the country's outlying islands, the Taiwanese government supports the idea of Kinmen's initial cooperation with Fujian, however, specific economic and trade cooperation must still comply with policies and the law. The issues of an electricity link and a bridge link touch upon complex and sensitive issues such as cross-Taiwan Strait coordination of communication and future development of cross-strait relations, the MAC pointed out. The government respects all relevant suggestions on the development of Kinmen and will continue to communicate with the local government to prioritize operations that can be handled on a local level to promote the economic development of the county and the welfare of the people, the MAC said. Even though the MAC approved the water link, it also pointed out that Taiwan had to pay for the project and is not receiving the water for free. The government is well aware of Kinmen's need for water and has set a budget of NT$1.35 billion (US$44 million) to complete relevant projects, the MAC pointed out. Also, from now on, Taiwan will be paying NT$9.86 (US$0.32) per cubic meter of Fujian water, the MAC pointed out. Regarding the water link, Executive Yuan spokeswoman Kolas Yotaka said that the central government has approved the measure and sees the right of Kinmen's residents to have water as very important. Meanwhile, at an initiation ceremony held in Fujian, China's Beijing-based Taiwan Affairs Office Director Liu Jieyi (劉結一) called for persistence in upholding the values of the "one China" principle. People on both sides of the strait must unite and oppose Taiwan independence activities and promote peaceful cross-strait development, Liu said. According to an online Xinhua news agency report that day, the source of the water is the province's second-largest lake, Longhu Lake in Jinjiang City, and the 28-kilometer pipeline can provide 34,000 cubic meters of water daily which can be expanded to 55,000 cubic meters in the future.